Narrator: With loud shouts, however, they persisted in calling for his crucifixion, and their voices prevailed. The verdict of Pilate was that their demand should be granted. So he released the man who had been imprisoned for rebellion and murder, for whom they asked, and he handed Jesus over to them to deal with as they wished. Narrator: And when he had said this he breathed his last. Narrator: When all the people who had gathered for this spectacle saw what had happened, they returned home beating their breasts; but all his acquaintances stood at a distance, including the women who had followed him from Galilee and saw these events. Now there was a virtuous and righteous man named Joseph who, though he was a member of the council, had not consented to their plan of action. He came from the Jewish town of Arimathea and was awaiting the kingdom of God. He went to Pilate and asked for the body of Jesus. After he had taken the body down, he wrapped it in linen cloth and laid him in a rock-hewn tomb in which no one had yet been buried. It was the day of preparation, and the Sabbath was about to begin. The women who had come from Galilee with him followed behind, and when they had seen the tomb and the way in which his body was laid in it, they returned and prepared spices and perfumed oils. Then they rested on the Sabbath according to the commandment. Well as they say in Jerusalem . . . what just happened? He started out as a KING! Blessed is He who comes in the name of the Lord! And now he’s hanging on a cross. What just happened? What just happened, was the greatest story ever told. And it’s interesting to see all the characters. Pontius Pilate, Herod, Judas, Peter, the Faithful Women, the Roman Soldiers, Simon of Cyrene, the two thieves, Jesus. If you could be one of them, which one would you be? We see Simon of Cyrene . . . he was roped into this without knowing what was going on. Who was this Jesus anyway? But then, if you’ve seen the Passion of the Christ, you get a good idea at how much Simon must have been affected in carrying the cross with Jesus . . . if only he had more time to get to know him! Or Peter, who HAD a lot time to know Jesus, but has now denied Jesus three times! Way to blow it at the last minute! If only there was a way; to take it back, if only he had a little bit more time. 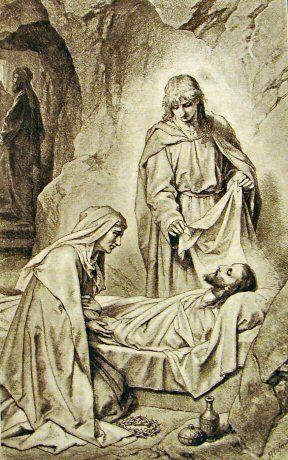 Or even Joseph of Arimithea and Nicodemus, two hidden followers – they didn’t make it to Jesus’side until He was already dead! And yet we know that Simon’s sons are mentioned as disciples in the Acts of the Apostles. 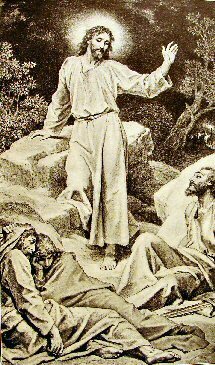 Joseph and Nicodemus became disciples as well, and Peter, well – he would soon remind our Lord that he loves Him! But the story I love best of all, is the one of the good thief. Straight forward, simple and to the point. Jesus, REMEMBER ME when you come into your Kingdom. Impeccable timing, as this thief didn’t have much more time! And how does our Lord respond? Irony of irony, it’s to the condemned criminal that Jesus promises SAINTHOOD then and there – Amen, I say to you, TODAY you will be with me in Paradise! The characters who had such little time to be with the Lord, so little time to reconcile with the Lord, and yet they took what little time they had, and said, JESUS, I’m sorry. JESUS, remember me. JESUS, you’ve died – but I’m here for you. Yeah, there are only a few days left of this Holy Season. Only a little bit of time left. Confessions’ available each day this week. And so, we have JUST the amount of time He needs to make saints of us. For He’s the Lord who REMEMBERS. The Catechism says that Jesus knew and loved EACH of us when He offered His life. Thank GOD for all His second-chance and last-chance saints, for they are now, SAINTS! They are now in Heaven. Dear Jesus, REMEMBERS ME, REMEMBER US, when you come into your kingdom.